We join with you in prayer and preparation during the season of Advent as we get ready to welcome Jesus into our hearts and homes on Christmas Day. Please join us for our wonderful holiday concert on Tuesday, December 4th at 6:30 in the church. Have a great weekend! Renewal families for the Income-based FTC scholarship may apply now for the 2019-2020 school year. Renewal families will have processing priority until January 31, 2019. Complete your application as soon as possible as SUFS grants scholarships on a first come first serve basis. Families interested in applying for the first time for SUFS Income-based scholarship for the 2019-2020 school year will find a link on the Step Up for Students home page to sign up for the Interest List. Check out the SUFS web site for additional information. The Christmas Concert is this Tuesday 12/4 at 6:30 pm. Please have your student arrive no later than 6:15 so they can be in their spot and ready to go by 6:30! Concert dress will be our Sunday Best! This means that the students do not need to be in uniform, but should keep in mind that this is a family event held at the St. Elizabeth Seton Church. Holiday and festive wear are ok and preferred! Please follow these guidelines: Females please no spaghetti straps or heels; males must wear dress slacks and a tie. Reader’s Theater and Drama students will wear their costumes for the Nativity Scene. NO CELL PHONES WILL BE ALLOWED AT THE CONCERT! Students should leave their personal devices with their parents/family/other guests before going to sit with their class. If there is an issue with attendance, please contact Ms. Watson (watson@seseton.org), your homeroom teacher, and Mrs. Niebuhr immediately. Students of the Week ~ Congratulations on your good work! St. Elizabeth Seton School will be collecting food donations to support the Weekend Power Pack Food Program of Catholic Charities in Collier County. 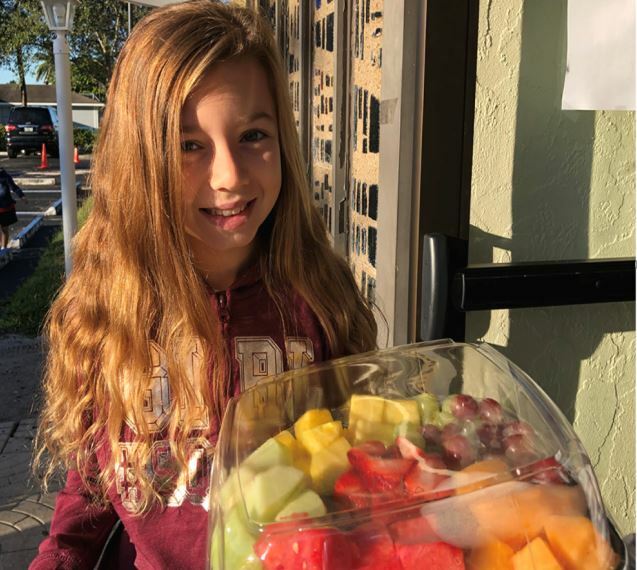 This program provides homeless elementary students living in Collier County with food to sustain them through the weekend when school meals are not available. The students receive containers of nutritious food on Fridays so they will have sustenance throughout the weekend. Do you know some area businesses that would be willing to donate items for the auction? Please contact Dr. Fabii (fabii@seseton.org) if you are able to contact them and obtain a donation. Forms are available in the Advancement Office. Please see our save the date card! 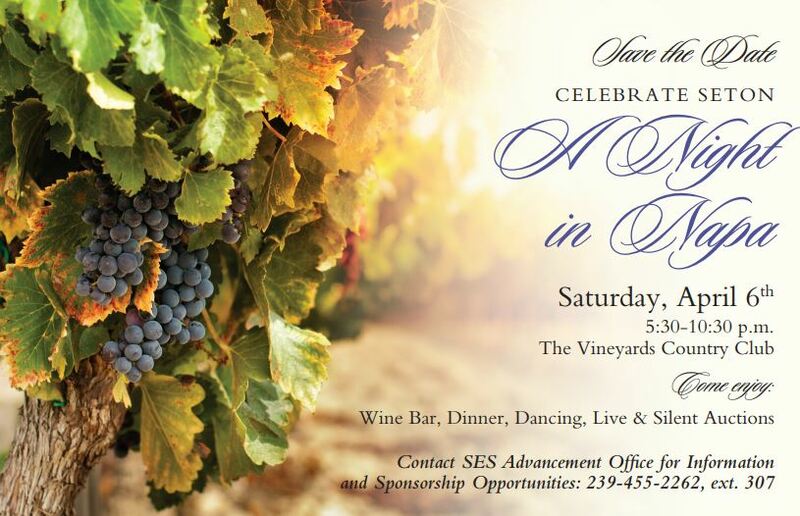 Tickets $75 – includes buffet dinner, wine bar, dancing, entertainment, live and silent auctions. Cash bar also available. Just a few more weeks! Online sales until January 1st! Go to www.yankeecandlefundraising.com. Enter the group number 999972306 in the “Start Shopping” box. Any orders purchased online will pay for shipping/tax, and the products will be shipped directly to your home. NOTE: We have an unclaimed Yankee Candle order in the office with no name. The order includes a tart candle assortment, 2 mobile vent caddies, Calphalon tongs and an egg/omelette set. Please call the office to claim. Last sale before Christmas! See the updated catalog. Sale deadline is Wednesday, December 7th. Checks payable to St. Elizabeth Seton School. Thank you for your support! Download the Catalog here, and the order form here. Tuesday, December 4, 2018 at 6:30 p.m. in the church. Please come! Donations Needed: Christmas Lights, Christmas Blow Up and Christmas Decorations. Happy Holidays! The Penguin Patch Holiday Shop is a fun way for students and parents to shop for family members and experience the spirit of giving while learning to earn, budget and save. We will be posting a shopping schedule for the kids soon, but the dates for Penguin Patch Shop are from December 10-14. Budget envelopes will be sent home with your child and will have the day when your child will shop that week. Over 100 choices of gifts are priced from .25c to $10.00. We are also looking for parent volunteers for the Shop. Look for our Sign-Up Genius email to come. Thank you! Emma Trombly was a Blue Zone Birthday Girl this month! Way to go!